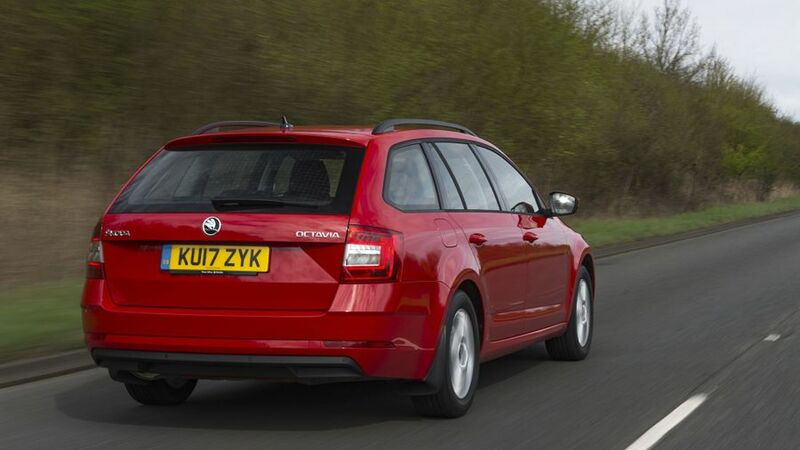 The Skoda Octavia Estate is a fantastic all-rounder. It might not appeal to everyone’s heart, but it ticks every box that any head would want. It’s hugely spacious, well-equipped and priced keenly, and full of clever features to make everyday life easier. It all adds up to a very attractive package, and for our money, it’s one of the very best cars of its type. Plenty of kit and performance without costing the earth. This version of the Skoda Octavia Estate is a facelifted version of the 2013 car, and it trades that car’s conservative looks for rather more radical ones. The most notable change lies at the front, with a new split headlight design and wider grille. Full LED headlights are included on SE L models and above, and LED taillights are standard across the range. All models also get alloy wheels. The performance-focused vRS model can be spotted by its more aggressive bodykit, lowered suspension and standout 18-inch alloys housing red brake callipers. The Scout version, meanwhile, adopts more of an SUV-like appearance, with chunkier, scuff-plated bumpers and a jacked-up ride height. The Octavia’s delivers a very comfortable driving position, with a seat that has a massive range of adjustment and a steering wheel that’s adjustable for both height and reach. What’s more, there’s a real swishness to the quality of the materials and an impressive sense of solidity to the assembly. The touch-screen infotainment system – available in different sizes across the range – uses touch-sensitive black panels rather than traditional buttons to navigate between different menus. While it looks sleek and is pretty easy to use as touch-screen systems go (trying to pinch and swipe, smartphone-style, is no substitute for dials and buttons when you’re driving), it does attract fingerprint marks rather easily. 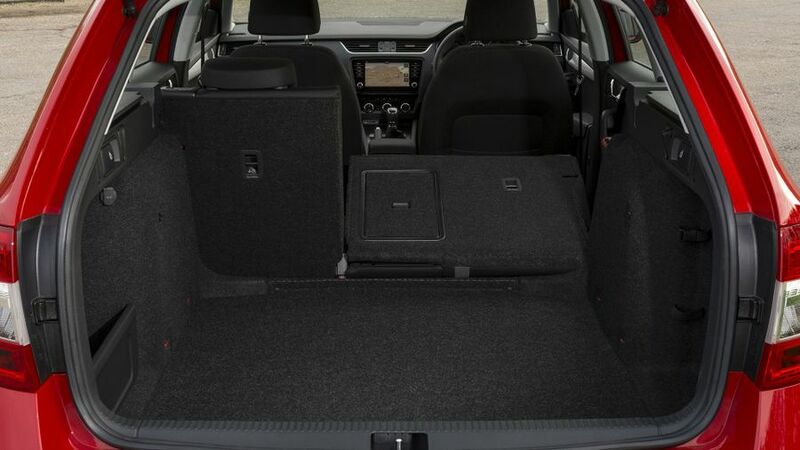 This is an essential area for any estate car, and one of the Octavia’s most attractive features is the immense space it provides for both passengers and luggage. Rear leg- and headroom is super-generous and the 610-litre boot rivals much larger (and more expensive) cars. Fold the seats down with a couple of tugs on levers, and that space expands to 1740 litres. Features on all cars include an ice scraper inside the fuel flap, two USB ports, a bottle holder that lets you open the bottle with just one hand, and a removable, magnetic LED light in the boot. On its standard suspension setup, the Octavia wagon delivers an impressive blend of comfort and control. It soaks up bumps in the road effectively, and although you can occasionally hear the suspension going about its work through a series of knocking sounds, it’s very rare that you feel it to a degree that’ll annoy you. Yes the suspension is less effective at lower speeds than it is on the motorway, but it never has you wincing. Body control is well contained as well, and there’s plenty of grip and responsive, predictable steering, and it all adds up to handling that’s capable and assured. Cars fitted with optional adaptive dampers have a very similar character, and the differences between the various driving modes are very small, so we don’t think it’s an option worth bothering with. If you’re a keen driver, you might feel that the Octavia is lacking in thrills, but with a car like this, most buyers would take comfort over kicks any day. Besides, if it’s kicks you’re after, you can go for the vRS version, which provides it in spades. It has a lower, stiffer suspension than the others, which trades a little bit of ride comfort for added sharpness in bends. It’s really effective, though, because the vRS is an absolute hoot when you’re in the mood, but still civilised enough to keep you comfy when you’re not. The Scout’s suspension, meanwhile, goes the other way. The fact it rides higher makes life a little cushier, as does the fact that the Scout has a more sophisticated rear suspension setup than most of the other models. The mainstream versions of the Octavia are available with a choice of two petrol engines and two diesels. The diesels will suit those doing regular high mileage; the 113bhp 1.6-litre is sufficient for everyday motoring, with enough grunt to mean you won’t have to stir the gearbox too much to achieve decent progress. But, if you’re regularly carrying loads or passengers – which, if you’re buying an estate car, you probably are – then the extra power and torque of the 148bhp 2.0-litre diesel might be more up your street. As for the petrol models, the 113bhp 1.0-litre, three-cylinder turbocharged unit is surprisingly perky, with more than enough performance and flexibility for an easy life. But like with the diesels, if you regularly carry much in the way of people and luggage, you’ll welcome the extra muscle provided by the 148bhp 1.4 turbo. And when you’re not weighed down with cargo, it provide seriously fizzy performance. The sporty vRS models, available in both petrol and diesel forms, kick things up a notch further on that score. The 181bhp 2.0-litre diesel has a truly mighty mid-range, allowing you to build speed very quickly indeed, but because the grunt tails off towards the top of the rev counter, it’s best to shift up before you get anywhere near the redline. The 227bhp petrol, meanwhile, is a joy to rev out to its limits, giving you a proper performance car character as well as proper performance car pace. It also pulls hard from anywhere on the dial, making that scorching performance accessible and easy. Like most engines in the range, these vRS models are available with a twin-clutch automatic gearbox, but with all of them – particularly in the case of the petrol-powered vRS – the car is much better with the manual shifter you get as standard. That said, there is another version of the vRS petrol – with 242bhp – that we’re yet to try. The Scout is available with both versions of the 2.0-litre diesel engine. On all versions of the Octavia we have sampled, none of the engines are noisy to a bothersome level, although the 1.0-litre petrol and smaller diesel can chug a bit if you work them hard. Road- and wind noise are also impressively well contained, even at motorway speeds. The Octavia Estate is well priced compared with its rivals, especially considering how much car you get for the money. The engines are economical and have low CO2 figures, particularly in the smaller petrol and diesel units, which means lower Benefit-in-Kind bills for company car drivers and low fuel bills. 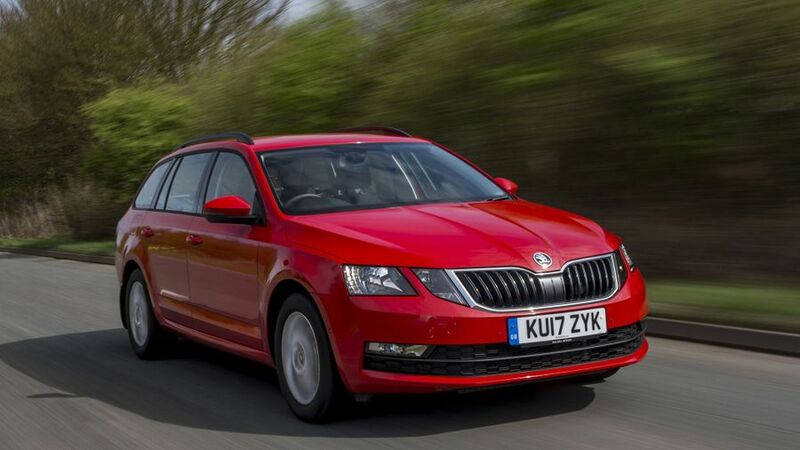 Skoda fares well in the Warranty Direct Reliability Index, sitting towards the top of the manufacturer rankings. The Octavia isn’t quite as well regarded as an individual model, however, with engine, electrical and suspension problems accounting for a sizable chunk of warranty claims in the past. Having said that, our owner reviews for the pre-facelift Octavia show a largely positive experience with the car. 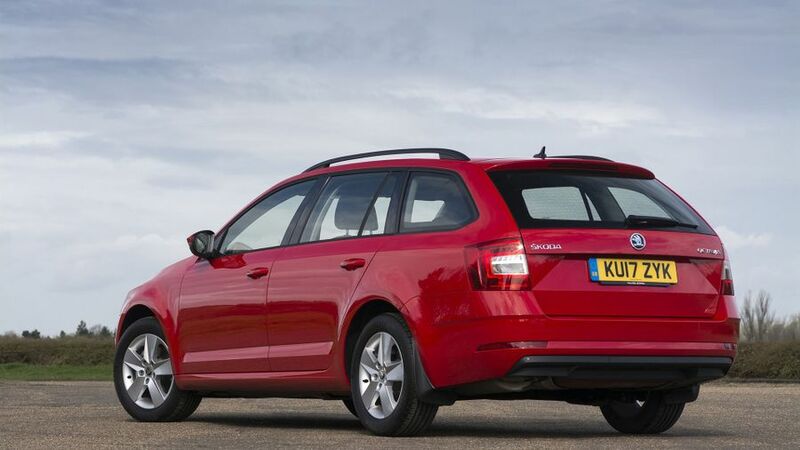 As standard, Skoda offers a two-year, unlimited mileage warranty and will also cover new cars for a third year up to 60,000 miles. It also includes a 12-year body protection warranty. The pre-facelift Octavia hatchback was crash tested by Euro NCAP in 2013 and scored a maximum five stars. All cars include a tyre-pressure monitoring system, front and knee airbags, as well as front side airbags. A driver alert system – which warns of fatigue – is included in SE models and above, but features like lane assist and blind spot monitoring are options. Automatic emergency braking is only included on models from SE Technology upwards, which is a shame at a time when manufacturers are increasingly including it as standard across many model ranges. 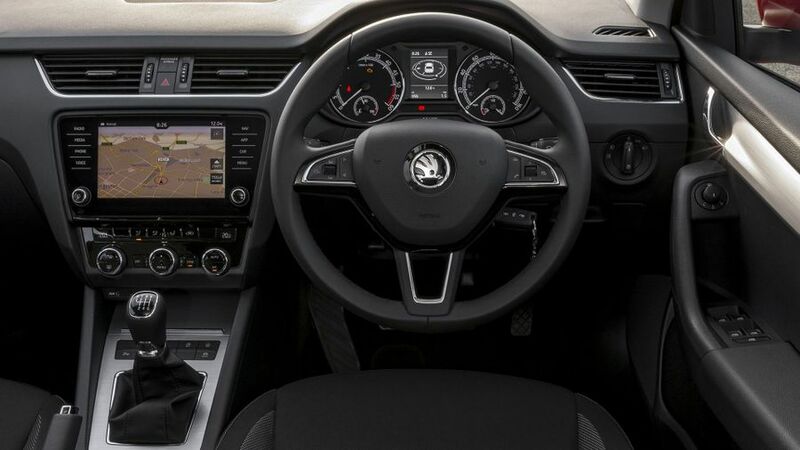 All Octavias have a decent level of equipment as standard, including an infotainment system with DAB radio and smartphone connectivity, controlled through an 8.0-inch touch-screen. SE models add cruise control and dual-zone air conditioning, while SE Technology cars have an upgraded infotainment system, adaptive cruise control and parking sensors both front and back. SE L models give you 17-inch alloy wheels, leather and Alcantara upholstery and full LED headlights, while the L&K variant includes a larger 9.2-inch infotainment screen, an upgraded sound system and 18-inch alloys. The vRS model has 18-inch wheels and red seams on the upholstery. You want a practical and economical estate car at a competitive price. The Octavia may not set everyone’s pulse racing, but it’s a very sensible choice that gives you a lot of car and kit for your money, and comes in enough varieties to suit most tastes and needs. An exceptional all-rounder and a fabulous family car.